"Testing the Zenithstar 110 Triplet Apo". 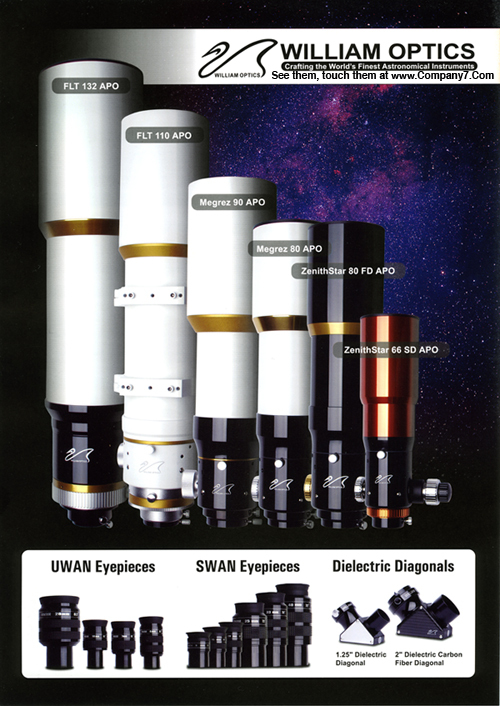 Beautifully done complete 5 page color illustrated review of this versatile telescope. Includes sketches of Jupiter, reviews of deep sky obseving, discussion of experiences with imaging through the ZS 110 with a Digital SLR Camera accompanied by sample images of: The Great Nebula in Orion M-42, Saturn (with two of it's moons), and the Earth's Moon. Publication by Jan Adelaar and Fred Hissink of The Netherlands, Copyright 2007 all rights reserved. From Company Seven's Archives. Document is 8-1/2 x 11/69 inch, 1,352,741 bytes (in Acrobat Reader ".pdf" format). These William Optics documents are available for online viewing or for download as files. Adobe 'Acrobat Reader' is required to display or print a ".pdf" document. If you do not already have the software then download it free from Adobe's web site. in one of America's last remaining telescope specialty stores.